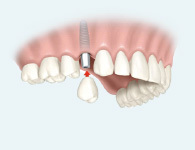 Dental Implants are small screw like fixtures that are surgically inserted into the jawbone to form an artificial tooth root which anchors in place a new tooth crown. Dental implants can be used to replace any amount of teeth - from a single missing tooth to full mouth restoration - and our expert dental team will tailor treatment plans to suit your personal requirements. 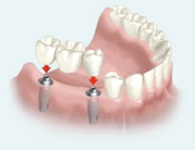 Some examples of some of the common types of cases we treat are shown below. 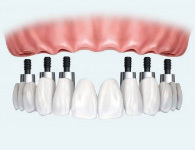 One option for full mouth restoration at our clinic is ‘All on 6 implants’; which is 6 dental implants placed, that are used to support a full set of teeth on a 12 unit bridge. 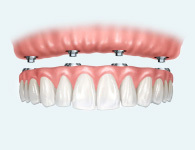 Another option for full mouth restoration at our clinic is ‘All on 4 implants’; which is 4 dental implants supporting a full set of removable dentures.